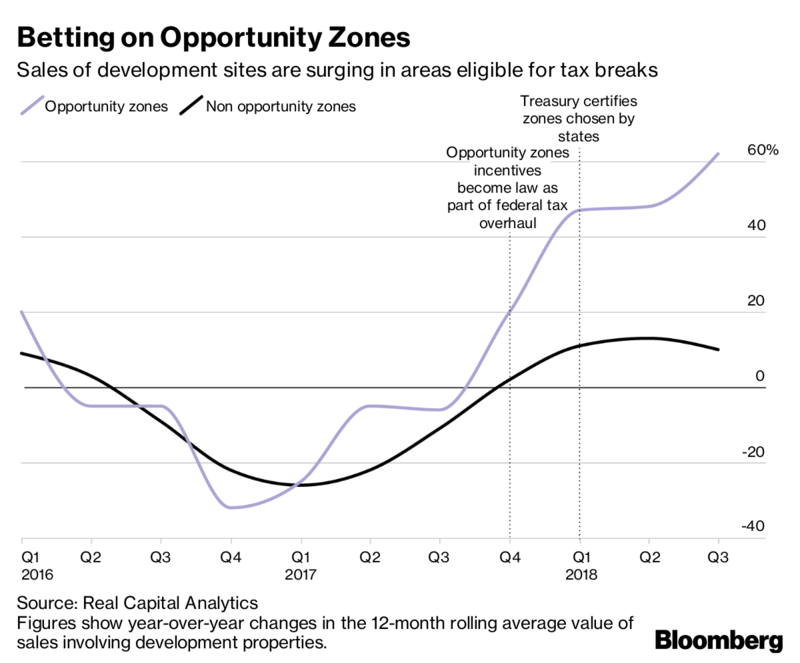 (Bloomberg) --In a former warehouse on a dimly lit street in the South Bronx, developers sipping Puerto Rican moonshine listened as a local official urged them to capture a new U.S. tax break by rebuilding the decaying neighborhood. Already, a policy debate is raging. Backers are urging people to reserve judgment and say the tax breaks have galvanized cities, businesses and investors to think creatively about boosting parts of the country most in need. Critics say the incentives were poorly calibrated and may amount to a boondoggle far in excess of the official $1.6 billion projected cost. In November, Amazon.com Inc. selected Long Island City for its next headquarters. Portions of that Queens neighborhood, including a former plastics factory the retailer plans to occupy, are inside opportunity zones, even though they’re among the city’s fastest-growing areas. In 2017, more apartments were built there than in any other neighborhood in the city. Alex Flachsbart, 30, has a lot of time to talk when he’s in his SUV crisscrossing Alabama. A lawyer who specialized in economic development grants and tax breaks, he quit his job last year to start Opportunity Alabama, aiming to connect capital to worthy projects. For the past several months, he’s been educating people about opportunity zones, speaking to local officials, businesses and investors. Flachsbart’s nonprofit—which has board members from the state’s largest utility and its biggest bank, Regions Financial Corp.—is now in talks for 10 potential projects that need more than $100 million in equity investment, he said. None have been funded yet, but he’s certain some will be. Meanwhile, he keeps driving. The move highlights how local officials have the power to respond to criticisms of the law—in this case, that investors may rush to build projects the community doesn’t want. Boulder has long been a favorite spot for growing companies because people want to live there, thanks to its college-town vibe and quick access to nature.